St Scholastica (died 543) founded a nunnery at Plombariola in Italy and is buried at Monte Cassino in the famous monastery of her brother, St Benedict. Her feast day is on 10 February. 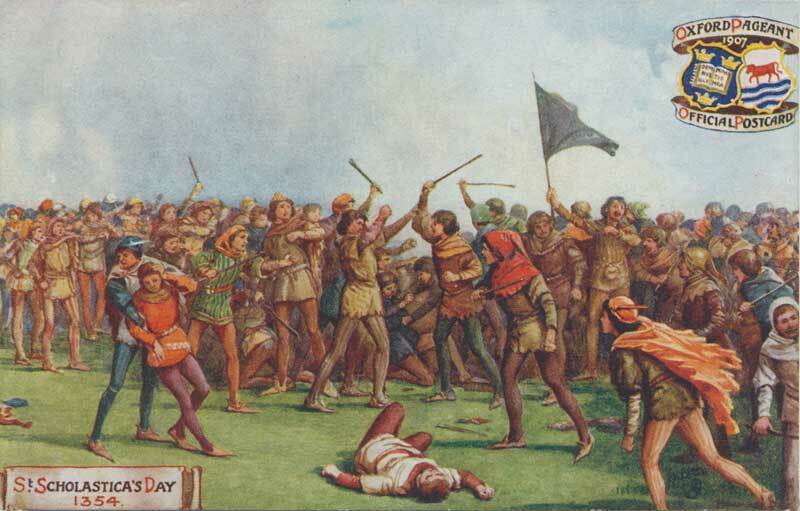 Because the most serious town and gown battle in Oxford took place on that day in 1354/5, it became known as the St Scholastica’s Day Riot. By coincidence, the saint’s name is also peculiarly appropriate for a riot involving the death of 62 Oxford scholars. On Tuesday 10 February 1355 some students and priests who were drinking in the Swindlestock (or Swyndlestock) Tavern at Carfax complained about the quality of the wine. The landlord (John of Barford or de Bereford, who happened to be Mayor of Oxford at the time) is alleged to have responded to their complaint with “stubborn and saucy language”; whereupon a student threw a quart pot at his head. Local people came to his aid, and had the bell at the City Church (St Martin’s at Carfax) rung to summon the townsmen to arms; then the University retaliated by rousing its students to the fray with the bell at the University Church (St Mary-the-Virgin Church in the High Street), and battle commenced, with both townsmen and students making good use of their bows and arrows. The next day (Wednesday) the Mayor rode to Woodstock to seek the support of the King, and meanwhile about 2,000 men came in from the country to help the town, crying as they advanced, “Slea, Slea…. Havock, Havock…. Smyte fast, give gode knocks.” They broke into academic halls, killing scholars, and this continued on the Thursday. In all, 62 scholars were killed. The rioters were severely punished. The Mayor and Bailiffs had to attend a Mass for the souls of the dead every St Scholastica’s Day thereafter, and to swear an annual oath to observe the University’s privileges. (The oath itself, however, was already in existence, and had been sworn since 1213 following the murder of three clerks by townsmen.) After 1355 the Mayor and Bailiffs (together with 62 citizens representing the number of scholars slain) would march to the University Church of St Mary the Virgin, where the Vice-Chancellor of the University awaited them, together with the Vicar of St Mary-the-Virgin Church, the Proctors, and the University Registrar. The Bailiffs then had to hand over sixty-three pence, usually in small silver coins. Thomas Dennis, Mayor in 1642/3, did not put in an appearance at St Mary-the-Virgin Church on St Scholastica’s Day1643 and when the Vice-Chancellor of the University asked for the reason, the council decided not to attend again unless compelled to do so by law because “the originall was superstitious and besides they are often jeared by the Schollars that the mayor weres a halter about his neck on that day”. The ceremony was abolished in 1825. In 1955, to celebrate the 600th anniversary of St Scholastica’s Day, the Vice-Chancellor conferred the degree of honorary D.C.L. on the Mayor, William Richard Gowers in the Sheldonian Theatre; and in return the Vice-Chancellor, A. H. Smith, was made a Freeman at the Town Hall.